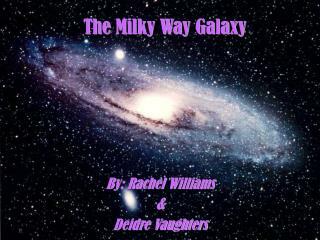 The Milky Way Galaxy is a nearly self-contained system that cycles stellar remnant materials into the interstellar medium and then back into stars. 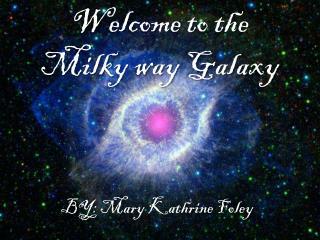 The Milky Way galaxy is rich in structure and physical processes. 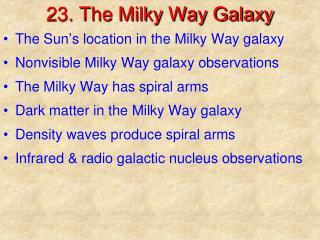 The Milky Way Galaxy is the spiral galaxy of which the Sun is a part. From Earth, it appears as a band of light around the sky. 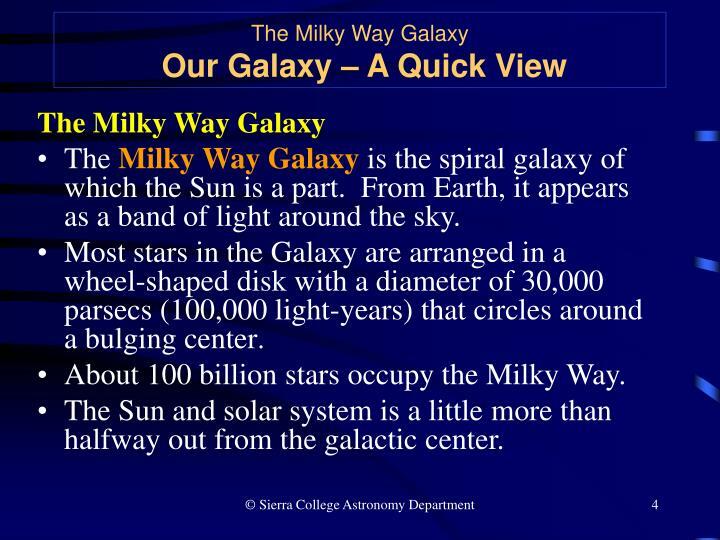 Most stars in the Galaxy are arranged in a wheel-shaped disk with a diameter of 30,000 parsecs (100,000 light-years) that circles around a bulging center. 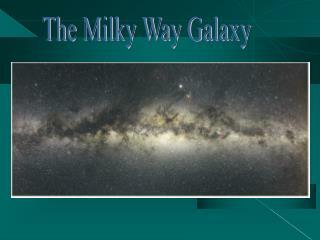 About 100 billion stars occupy the Milky Way. 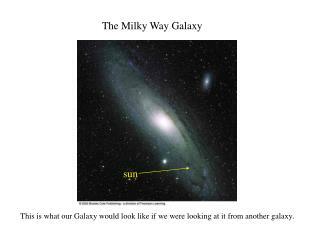 The Sun and solar system is a little more than halfway out from the galactic center. 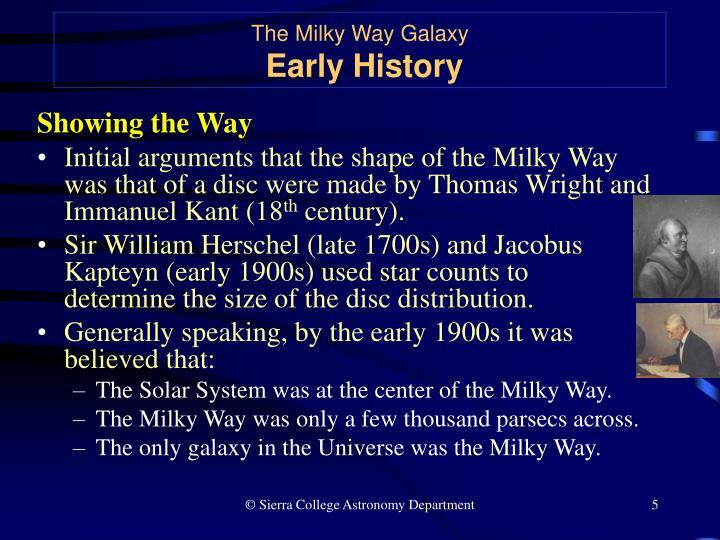 Initial arguments that the shape of the Milky Way was that of a disc were made by Thomas Wright and Immanuel Kant (18th century). Sir William Herschel (late 1700s) and Jacobus Kapteyn (early 1900s) used star counts to determine the size of the disc distribution. 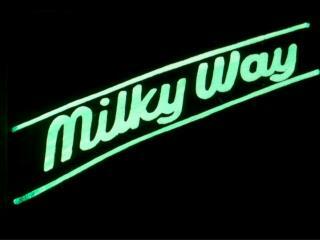 The Solar System was at the center of the Milky Way. 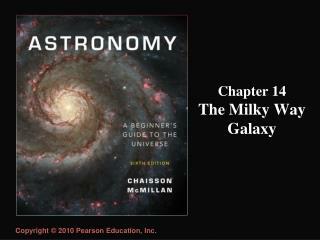 The Milky Way was only a few thousand parsecs across. 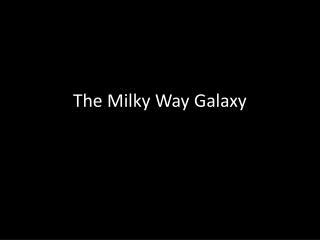 The only galaxy in the Universe was the Milky Way. Did not appear to be uniformly distributed across the sky. Appear to be concentrated in the direction of Sagittarius. 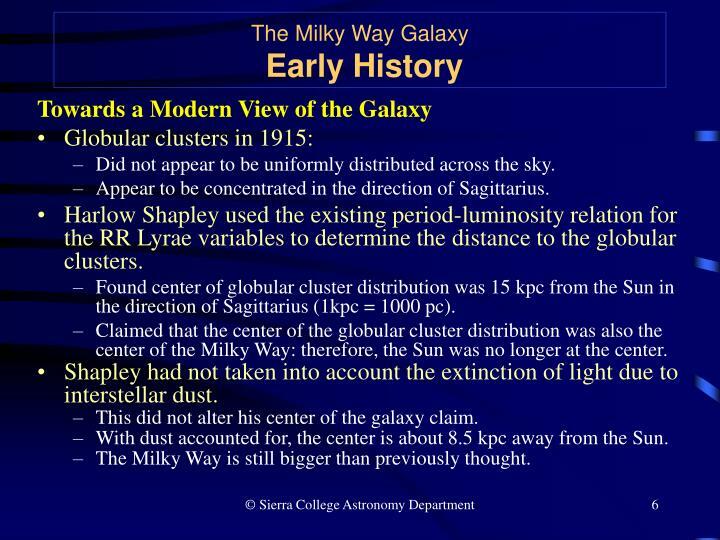 Harlow Shapley used the existing period-luminosity relation for the RR Lyrae variables to determine the distance to the globular clusters. Found center of globular cluster distribution was 15 kpc from the Sun in the direction of Sagittarius (1kpc = 1000 pc). 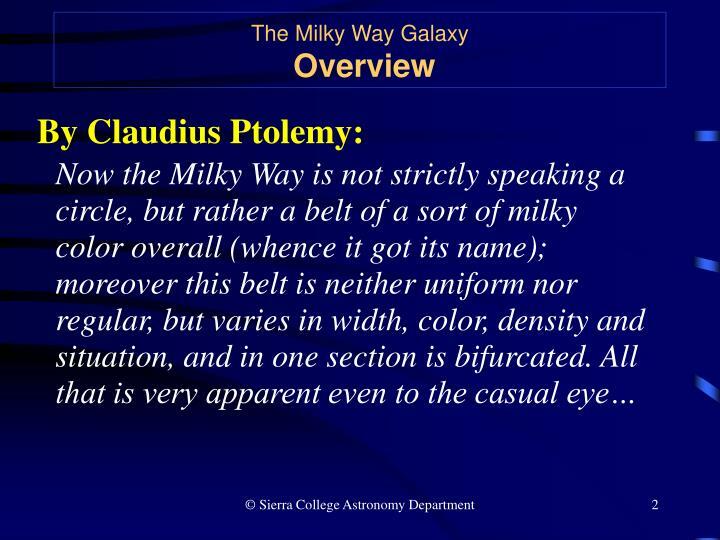 Claimed that the center of the globular cluster distribution was also the center of the Milky Way: therefore, the Sun was no longer at the center. 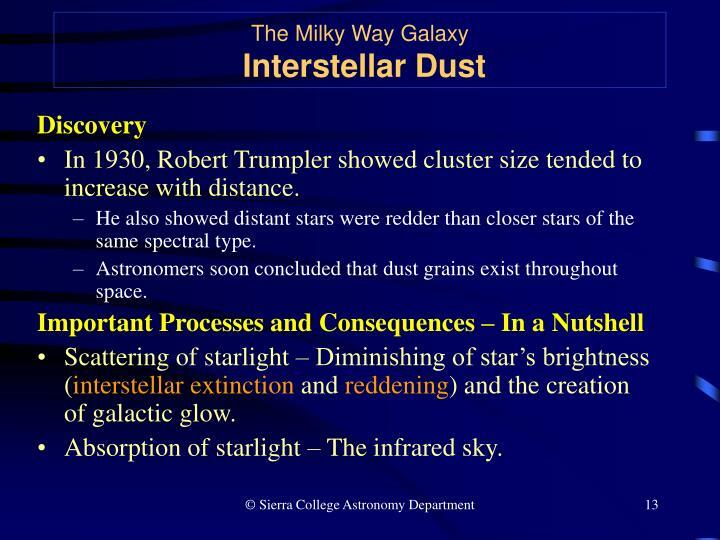 Shapley had not taken into account the extinction of light due to interstellar dust. This did not alter his center of the galaxy claim. With dust accounted for, the center is about 8.5 kpc away from the Sun. 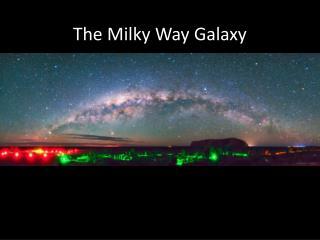 The Milky Way is still bigger than previously thought. Contains most of the stars (including the Sun) and the interstellar gas and dust in a 100,000 light-year diameter disk with a 1,000 light-year thickness. Star density is greater in the central plane (where most of the O stars are) and falls off above and below this plane. Stars generally rotate in the same direction with a “bobbing up and down” motion that gives the disk its thickness. 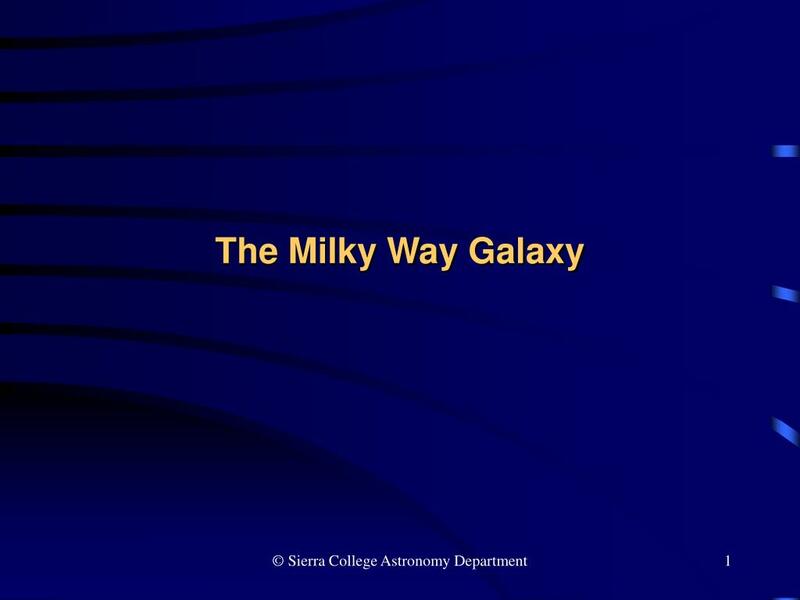 Somewhat flattened collection of stars about 20,000 ly across with the galactic nucleus at its center. Star orbits are more or less elliptical in shape, but randomly oriented. Bulge stars have a lower metallicity than those in the disc (in astronomy, a metal is any element other than hydrogen and helium). 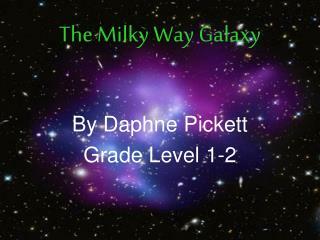 Consists of globular clusters (and a few small galaxies) and very low metallicity stars (lower than bulge). Spans disc diameter and star orbits are like those of the bulge. 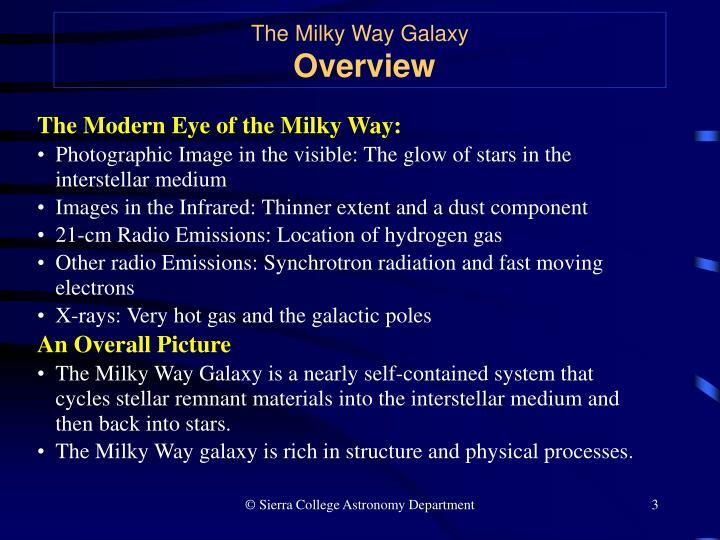 The Sun is traveling in a nearly circular path around the galactic center at a speed of about 220 km/s. 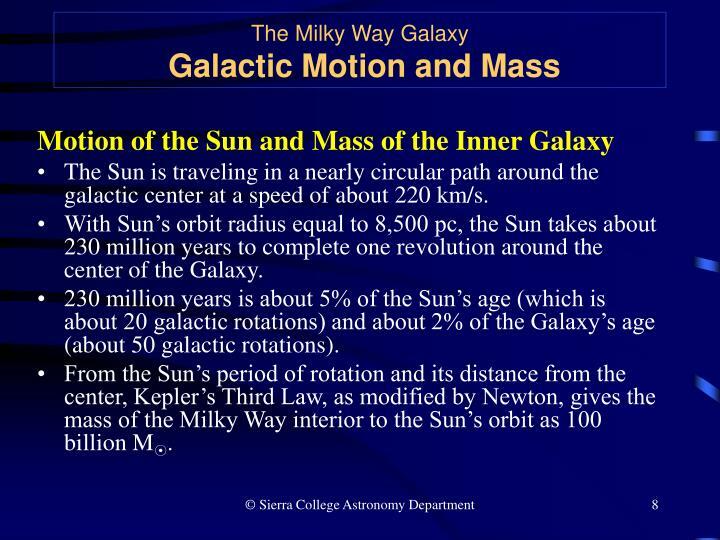 With Sun’s orbit radius equal to 8,500 pc, the Sun takes about 230 million years to complete one revolution around the center of the Galaxy. 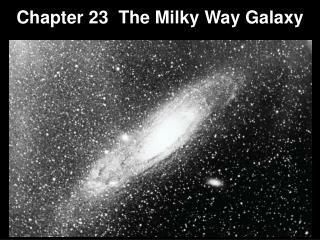 230 million years is about 5% of the Sun’s age (which is about 20 galactic rotations) and about 2% of the Galaxy’s age (about 50 galactic rotations). 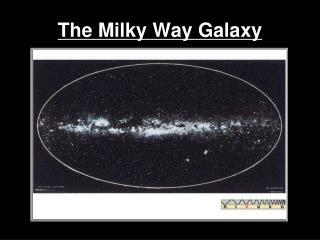 From the Sun’s period of rotation and its distance from the center, Kepler’s Third Law, as modified by Newton, gives the mass of the Milky Way interior to the Sun’s orbit as 100 billion M⊙. 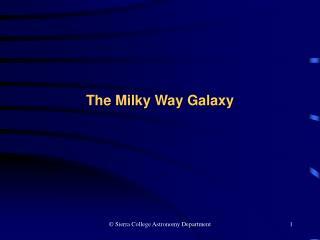 The galactic rotation curve of objects in the Milky Way’s disk shows that the galaxy undergoes differential rotation. 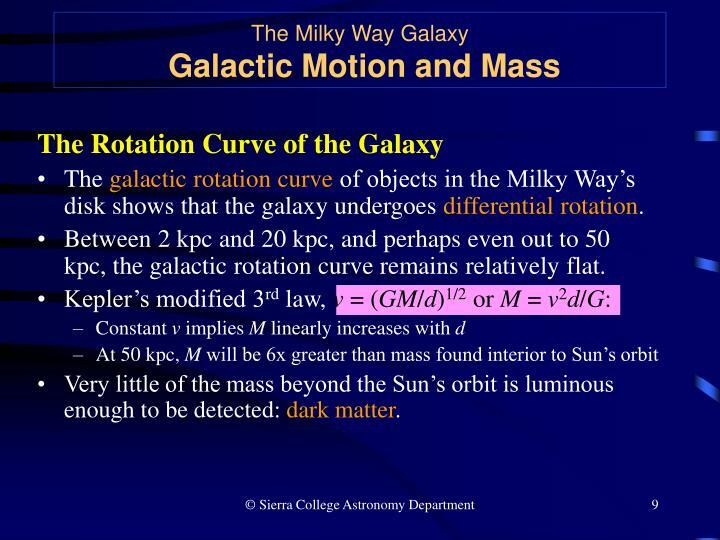 Between 2 kpc and 20 kpc, and perhaps even out to 50 kpc, the galactic rotation curve remains relatively flat. 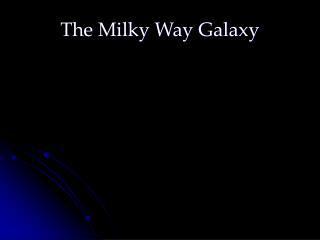 Very little of the mass beyond the Sun’s orbit is luminous enough to be detected: dark matter. 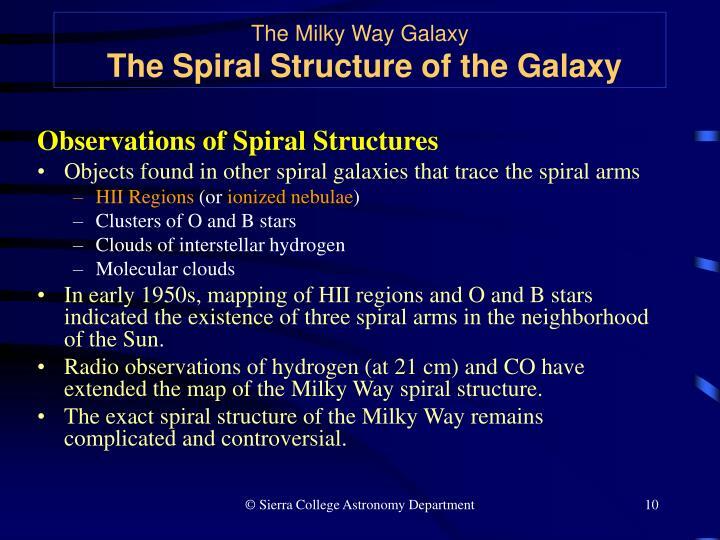 In early 1950s, mapping of HII regions and O and B stars indicated the existence of three spiral arms in the neighborhood of the Sun. 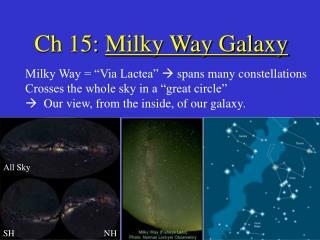 Radio observations of hydrogen (at 21 cm) and CO have extended the map of the Milky Way spiral structure. 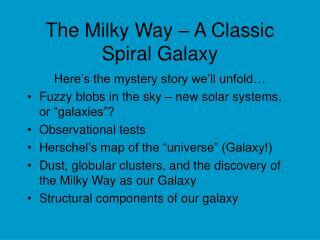 The exact spiral structure of the Milky Way remains complicated and controversial. Why are O and B stars forming only in the arms? 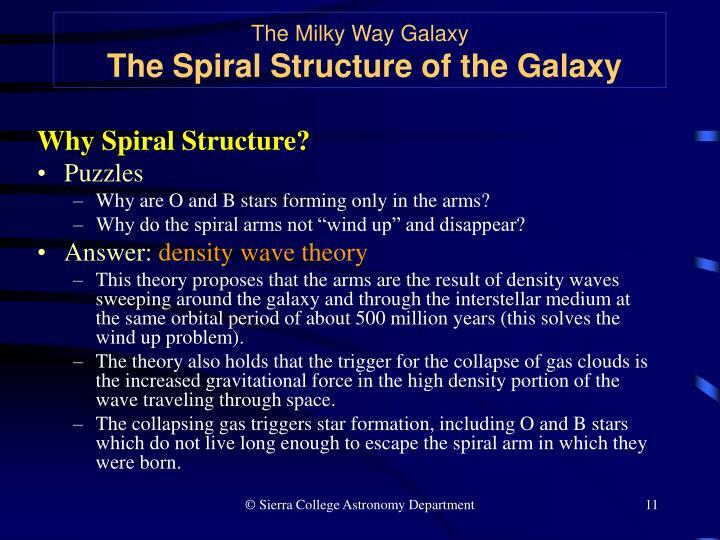 Why do the spiral arms not “wind up” and disappear? 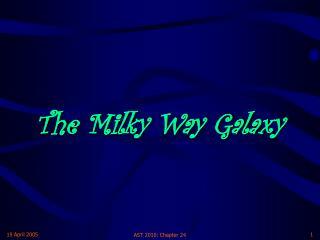 This theory proposes that the arms are the result of density waves sweeping around the galaxy and through the interstellar medium at the same orbital period of about 500 million years (this solves the wind up problem). The theory also holds that the trigger for the collapse of gas clouds is the increased gravitational force in the high density portion of the wave traveling through space. The collapsing gas triggers star formation, including O and B stars which do not live long enough to escape the spiral arm in which they were born. 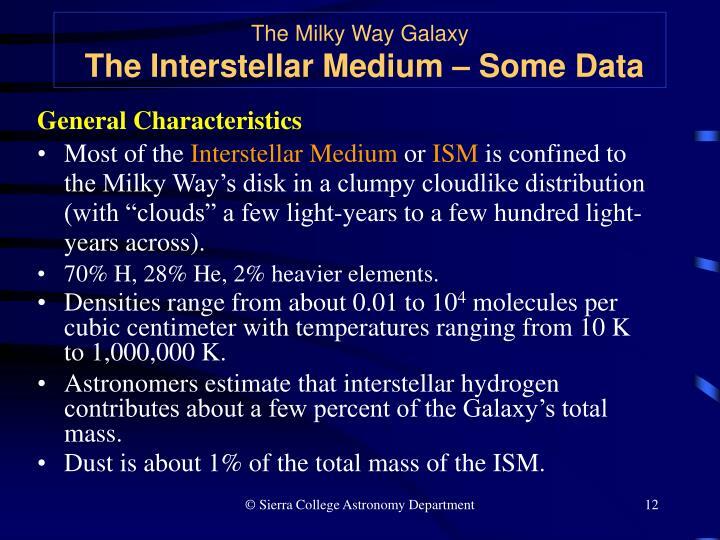 Most of the Interstellar Medium or ISM is confined to the Milky Way’s disk in a clumpy cloudlike distribution (with “clouds” a few light-years to a few hundred light-years across). 70% H, 28% He, 2% heavier elements. 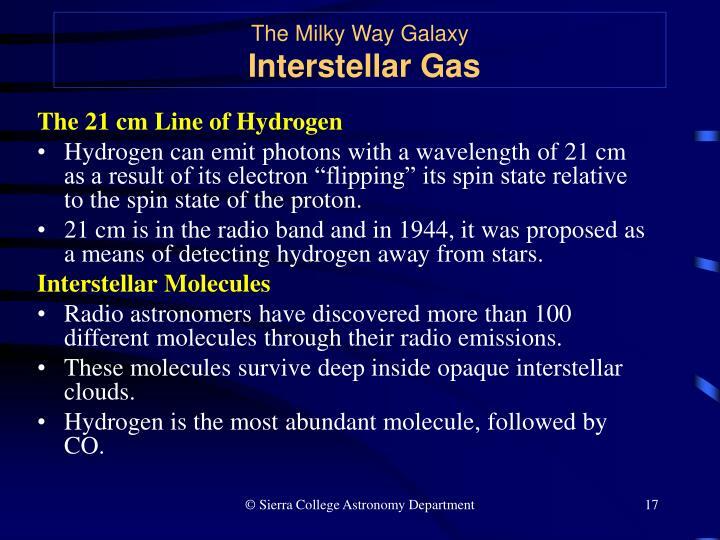 Densities range from about 0.01 to 104 molecules per cubic centimeter with temperatures ranging from 10 K to 1,000,000 K.
Astronomers estimate that interstellar hydrogen contributes about a few percent of the Galaxy’s total mass. Dust is about 1% of the total mass of the ISM. In 1930, Robert Trumpler showed cluster size tended to increase with distance. He also showed distant stars were redder than closer stars of the same spectral type. Astronomers soon concluded that dust grains exist throughout space. Scattering of starlight – Diminishing of star’s brightness (interstellar extinction and reddening) and the creation of galactic glow. 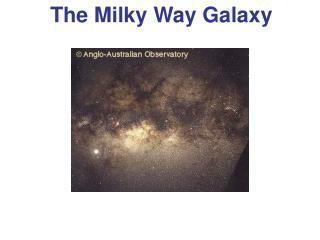 Absorption of starlight – The infrared sky. 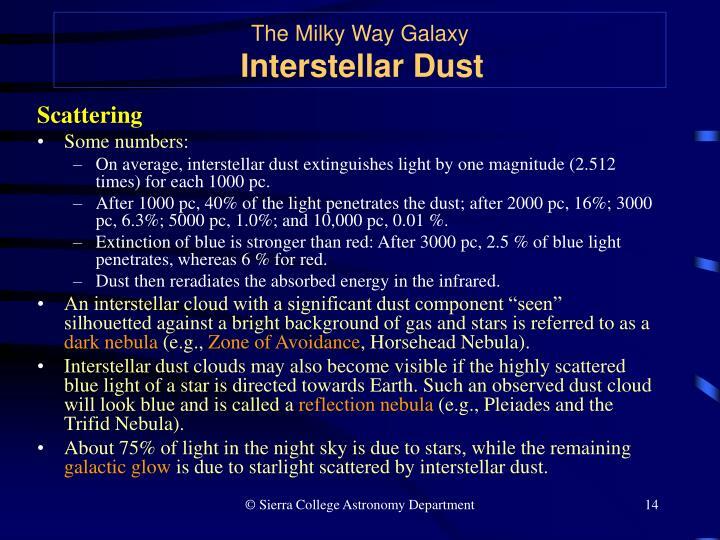 On average, interstellar dust extinguishes light by one magnitude (2.512 times) for each 1000 pc. After 1000 pc, 40% of the light penetrates the dust; after 2000 pc, 16%; 3000 pc, 6.3%; 5000 pc, 1.0%; and 10,000 pc, 0.01 %. Extinction of blue is stronger than red: After 3000 pc, 2.5 % of blue light penetrates, whereas 6 % for red. Dust then reradiates the absorbed energy in the infrared. An interstellar cloud with a significant dust component “seen” silhouetted against a bright background of gas and stars is referred to as a dark nebula (e.g., Zone of Avoidance, Horsehead Nebula). Interstellar dust clouds may also become visible if the highly scattered blue light of a star is directed towards Earth. Such an observed dust cloud will look blue and is called a reflection nebula (e.g., Pleiades and the Trifid Nebula). About 75% of light in the night sky is due to stars, while the remaining galactic glow is due to starlight scattered by interstellar dust. Fluorescence is the process of absorbing radiation of one frequency and reemitting it at a lower frequency. An emission nebula is a cloud of interstellar gas that fluoresces due to ultraviolet light from a star near or within the nebula. The most conspicuous type of bright emission nebula is an HII region; elsewhere, interstellar gas is much harder to detect visually. 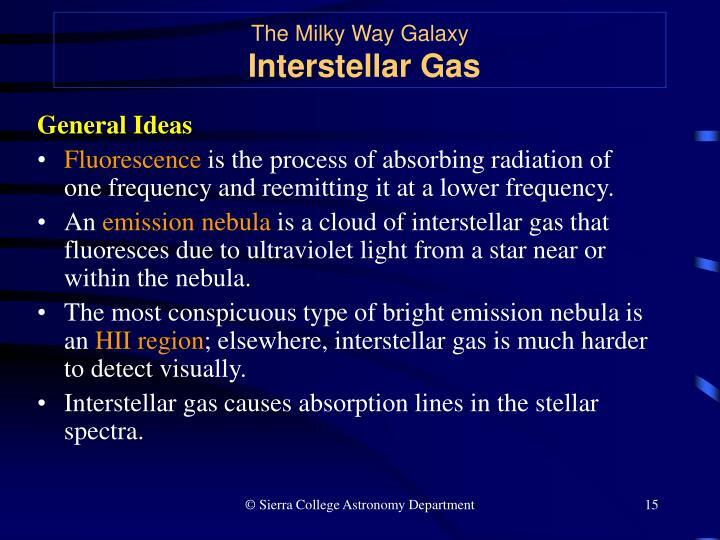 Interstellar gas causes absorption lines in the stellar spectra. 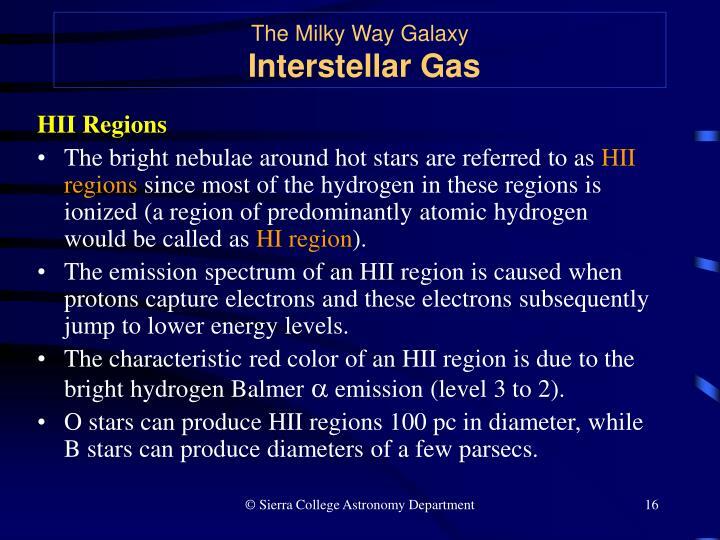 The bright nebulae around hot stars are referred to as HII regions since most of the hydrogen in these regions is ionized (a region of predominantly atomic hydrogen would be called as HI region). The emission spectrum of an HII region is caused when protons capture electrons and these electrons subsequently jump to lower energy levels. The characteristic red color of an HII region is due to the bright hydrogen Balmer a emission (level 3 to 2). O stars can produce HII regions 100 pc in diameter, while B stars can produce diameters of a few parsecs. Hydrogen can emit photons with a wavelength of 21 cm as a result of its electron “flipping” its spin state relative to the spin state of the proton. 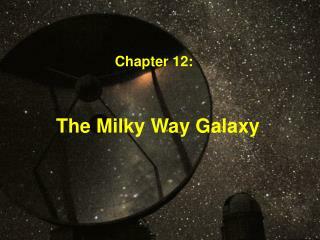 21 cm is in the radio band and in 1944, it was proposed as a means of detecting hydrogen away from stars. Radio astronomers have discovered more than 100 different molecules through their radio emissions. These molecules survive deep inside opaque interstellar clouds. Hydrogen is the most abundant molecule, followed by CO.
Interstellar gas has several “phases” dependent on densities, temperatures, and degree of ionization. 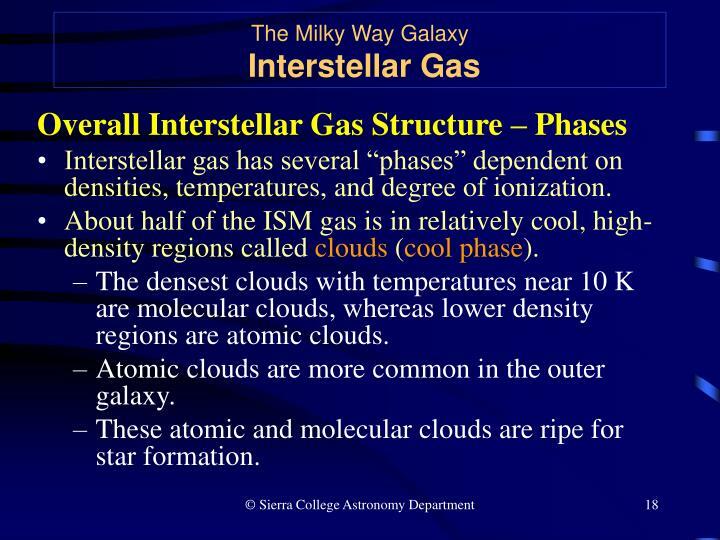 About half of the ISM gas is in relatively cool, high-density regions called clouds (cool phase). The densest clouds with temperatures near 10 K are molecular clouds, whereas lower density regions are atomic clouds. Atomic clouds are more common in the outer galaxy. These atomic and molecular clouds are ripe for star formation. Between clouds, temperatures are warmer (as high as 10,000 K) and less dense and may be ionized – this is the warm phase of the intercloud medium. 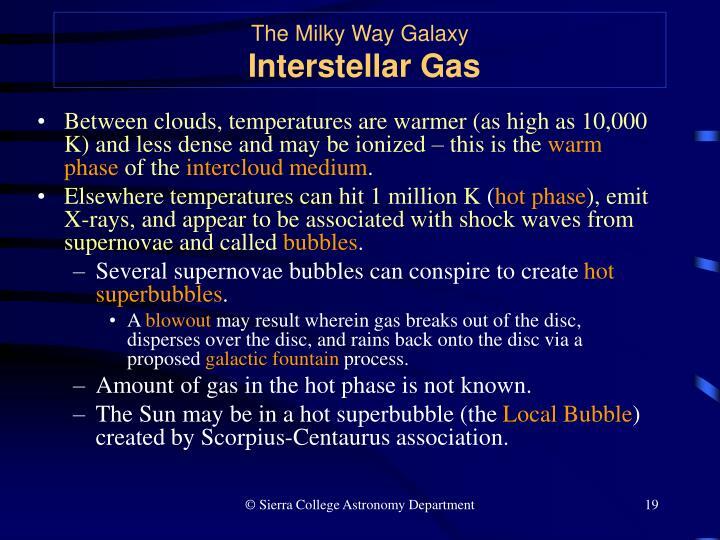 Elsewhere temperatures can hit 1 million K (hot phase), emit X-rays, and appear to be associated with shock waves from supernovae and called bubbles. Several supernovae bubbles can conspire to create hot superbubbles. 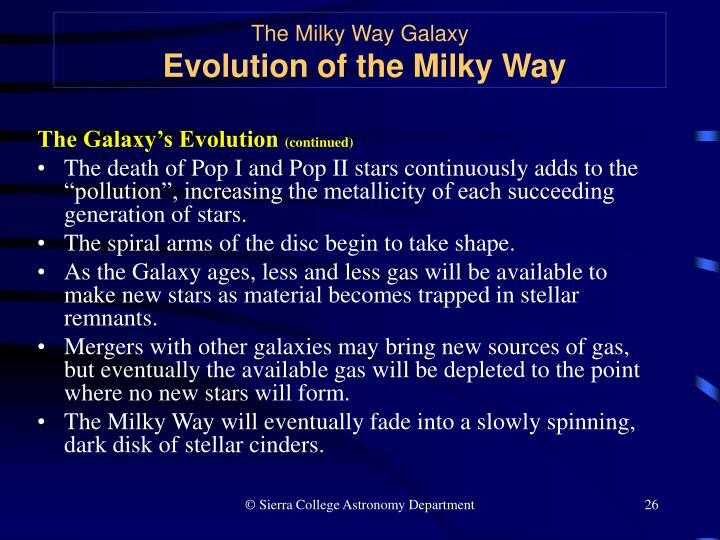 A blowout may result wherein gas breaks out of the disc, disperses over the disc, and rains back onto the disc via a proposed galactic fountain process. Amount of gas in the hot phase is not known. The Sun may be in a hot superbubble (the Local Bubble) created by Scorpius-Centaurus association. Too much dust lies between Earth and the center for visible observations to give reliable data. The wealth of data from the center has not yet yielded a consensus model. 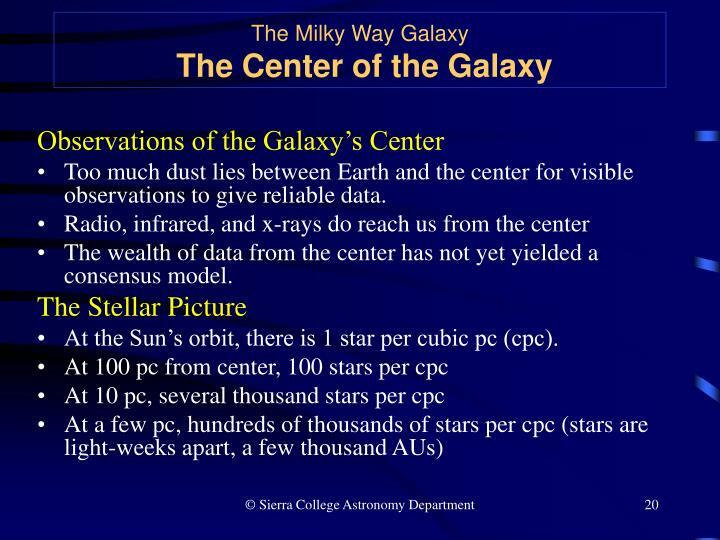 At the Sun’s orbit, there is 1 star per cubic pc (cpc). A thin ring of gas and dust rotates about the center between 2 and 8 pc. It rotates at 110 km/s meaning 10 million M⊙ resides within its orbit. 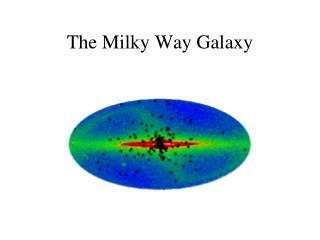 The ring is 10,000 M⊙ and consists of atoms and molecules, although the inner edge is ionized. 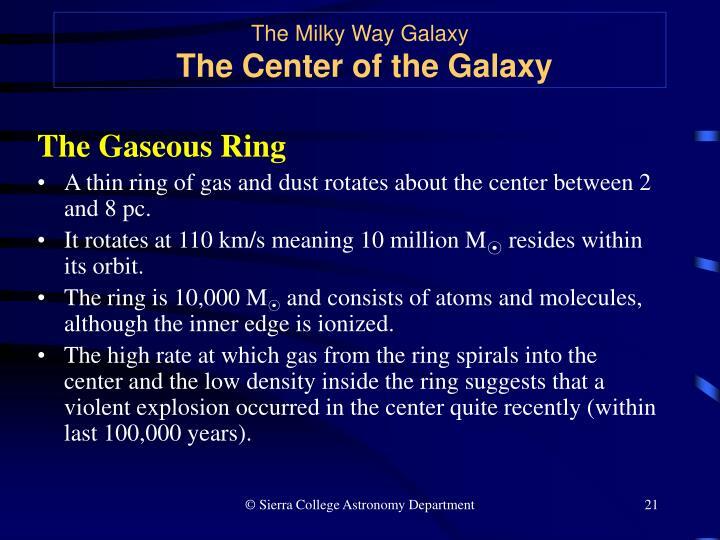 The high rate at which gas from the ring spirals into the center and the low density inside the ring suggests that a violent explosion occurred in the center quite recently (within last 100,000 years). Inside the gaseous ring, streamers of hot gas form a spiral-like pattern that converges to a point referred to as Sgr A* (a bright radio source). Gas and star speeds increase to very large values indicating that over a few million M⊙exist within 0.1 pc from the center. Sgr A* is 1 AU or smaller and appears motionless. 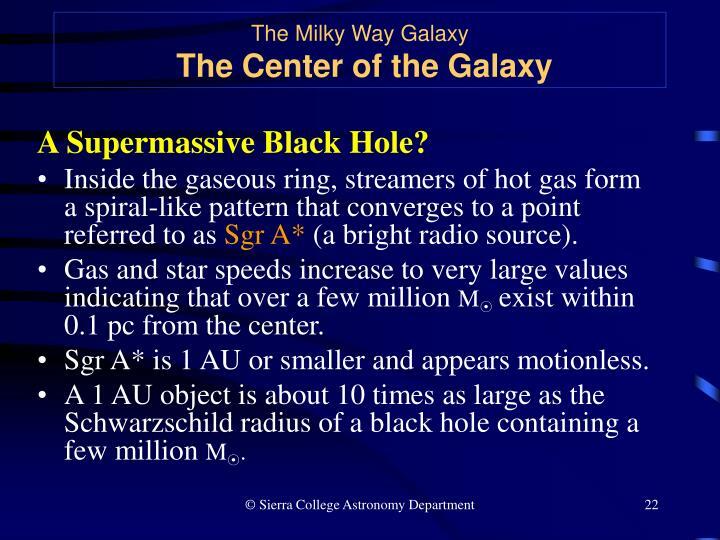 A 1 AU object is about 10 times as large as the Schwarzschild radius of a black hole containing a few million M⊙. 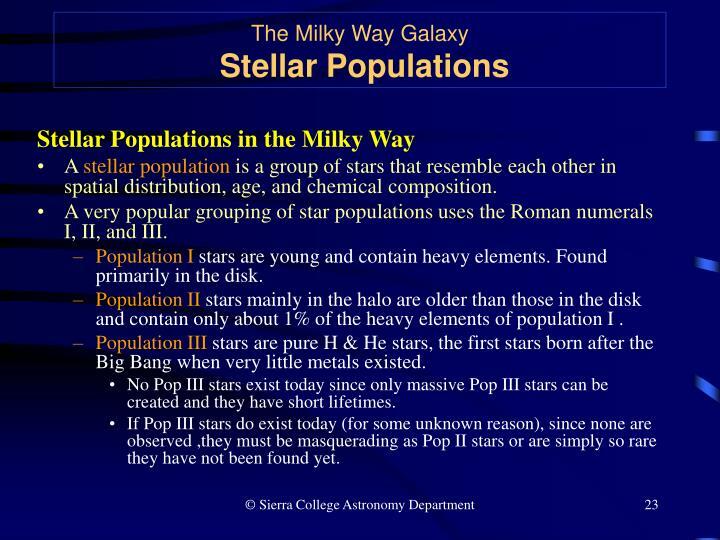 A stellar population is a group of stars that resemble each other in spatial distribution, age, and chemical composition. A very popular grouping of star populations uses the Roman numerals I, II, and III. Population I stars are young and contain heavy elements. Found primarily in the disk. 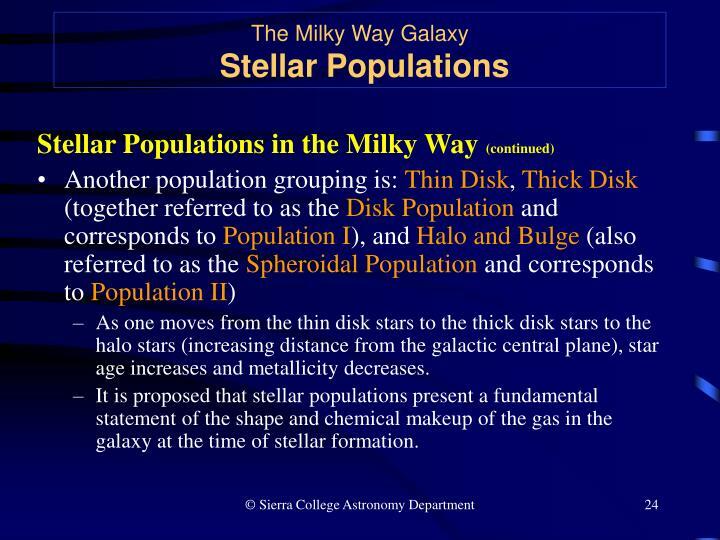 Population II stars mainly in the halo are older than those in the disk and contain only about 1% of the heavy elements of population I . Population III stars are pure H & He stars, the first stars born after the Big Bang when very little metals existed. No Pop III stars exist today since only massive Pop III stars can be created and they have short lifetimes. If Pop III stars do exist today (for some unknown reason), since none are observed ,they must be masquerading as Pop II stars or are simply so rare they have not been found yet. As one moves from the thin disk stars to the thick disk stars to the halo stars (increasing distance from the galactic central plane), star age increases and metallicity decreases. 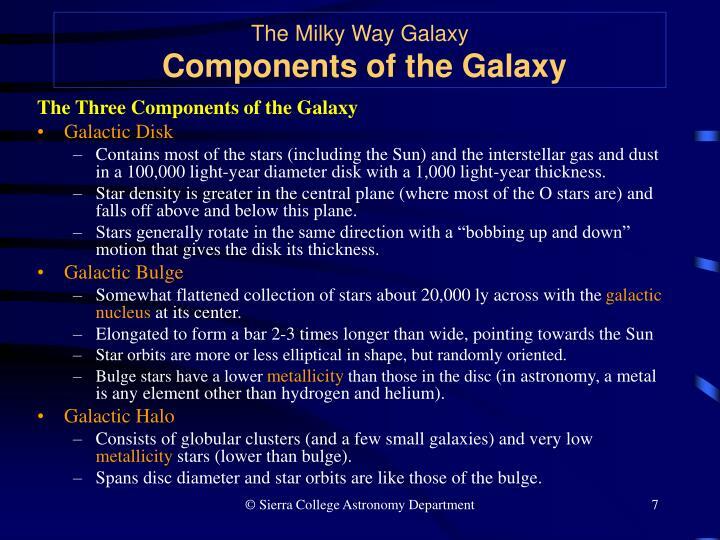 It is proposed that stellar populations present a fundamental statement of the shape and chemical makeup of the gas in the galaxy at the time of stellar formation. 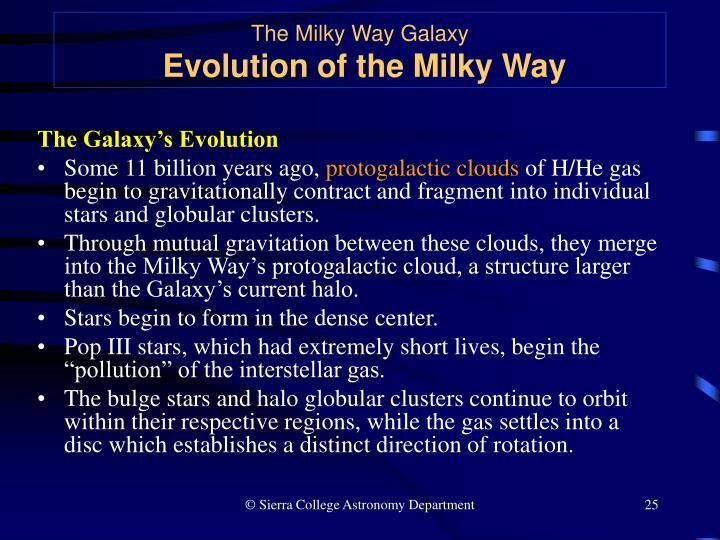 Some 11 billion years ago, protogalactic clouds of H/He gas begin to gravitationally contract and fragment into individual stars and globular clusters. 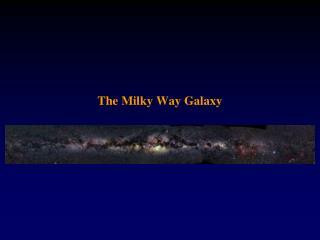 Through mutual gravitation between these clouds, they merge into the Milky Way’s protogalactic cloud, a structure larger than the Galaxy’s current halo. Stars begin to form in the dense center. 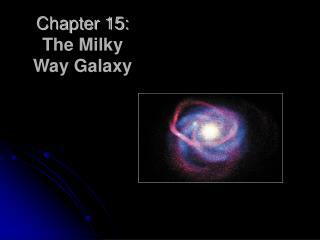 Pop III stars, which had extremely short lives, begin the “pollution” of the interstellar gas. The bulge stars and halo globular clusters continue to orbit within their respective regions, while the gas settles into a disc which establishes a distinct direction of rotation. The death of Pop I and Pop II stars continuously adds to the “pollution”, increasing the metallicity of each succeeding generation of stars. The spiral arms of the disc begin to take shape. As the Galaxy ages, less and less gas will be available to make new stars as material becomes trapped in stellar remnants. Mergers with other galaxies may bring new sources of gas, but eventually the available gas will be depleted to the point where no new stars will form. 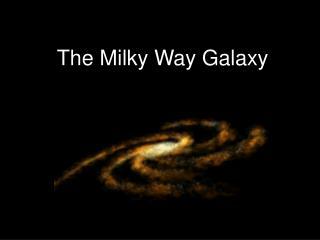 The Milky Way will eventually fade into a slowly spinning, dark disk of stellar cinders.